In Viet Nam, most of the public health staff (84%) currently works in rural areas, where 80% of the people live. To provide good quality health care services, it is important to develop strategies influencing staff motivation for better performance. An exploratory qualitative research was carried out among health workers in two provinces in North Viet Nam so as to identify entry points for developing strategies that improve staff performance in rural areas. The study aimed to determine the major motivating factors and it is the first in Viet Nam that looks at health workers' job perception and motivation. Apart from health workers, managers at national and at provincial level were interviewed as well as some community representatives. The study showed that motivation is influenced by both financial and non-financial incentives. The main motivating factors for health workers were appreciation by managers, colleagues and the community, a stable job and income and training. The main discouraging factors were related to low salaries and difficult working conditions. Activities associated with appreciation such as performance management are currently not optimally implemented, as health workers perceive supervision as control, selection for training as unclear and unequal, and performance appraisal as not useful. The kind of non-financial incentives identified should be taken into consideration when developing HRM strategies. Areas for further studies are identified. Many Ministries of Health are trying to improve the functioning of their health care system by introducing changes in resource allocation, better management and changes in the role of the government, such as more responsibility at lower levels through decentralisation. A prerequisite of a well-functioning system is a well-motivated workforce. The Ministry of Health in Viet Nam gives great importance to the development of a public health network, in order to provide good quality health care services. As most people live in rural areas, an extensive public health network is required in rural areas so as to provide appropriate care close to the people. This implies the need to keep sufficient qualified and motivated human resources in the rural areas. at an individual level, factors such as a person's job expectations, his or her self-esteem to be able to do a certain job and his/her own goals compared to the goals of the organisation. Motivation to accept and to remain at a post, which is related to meeting needs of job security, salary, etc. An organisation or institute can attract and keep personnel in their post through salaries, allowances and working conditions, such as the availability of equipment, and communication and relationship with colleagues. If the salaries and working conditions are unsatisfactory (for example, salaries do not cover the basic needs), health workers are likely to find ways to compensate for this. For instance, they will become more concerned with earning enough to cover their basic needs in other ways than to work hard for their public service post. In Herzberg's theory these are called "factors for dissatisfaction (dissatisfiers)". These dissatisfiers are mainly extrinsic factors. Motivation to improve performance is linked to a feeling of self-fulfilment, achievement and recognition [2, 3]. These feelings can be influenced by effective performance management, through which managers ensure that staff is competent and motivated in their job . It involves supervision, training, performance appraisal and career development. These satisfiers (or 'motivators') are based on intrinsic motivation. at the larger socio-cultural level, motivating factors such as the relationships between health workers and clients, support from community leaders and perception of community members with respect to services. Theories about motivation are, mostly, based on studies focusing on the private sector. To some extent motivation studies have been conducted in the public sector in developed countries . Little is known about the motivational factors that are important for health workers in developing countries . As the Ministry of Health gives importance to a public health network in rural areas in Viet Nam, knowledge on motivation of staff working in rural areas seems important. However, in Viet Nam little research has been conducted that document perspectives of health workers – at commune and district level in rural areas – on HRM factors influencing their motivation. Gaining a better insight in the way these health workers perceive their jobs and the importance they give to the various influences on their motivation will assist in developing strategies for improving performance of health workers in rural areas. In order to identify strategies to assist the Ministry of Health to motivate staff working in the public health network in rural areas, the Hanoi School of Public Health and the Royal Tropical Institute (KIT) conducted a study. The study aimed to describe the main factors influencing job motivation at commune and district health centres in rural areas of North Viet Nam and to recommend ways for improving motivation of health workers. The study looked at the relation between the implementation of various HRM tools in Viet Nam and the perception of health workers of these tools on their motivation. Herzberg's theory for motivation at the workplace  was used as a basis for the study design. 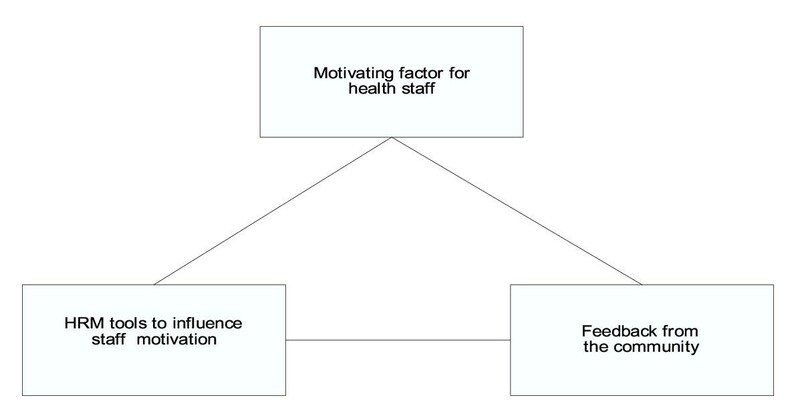 This model assists in clarifying the complex issue of motivation for health workers. The two-factor theory distinguishes between motivating factors (or 'satisfiers') that are intrinsic to the job and the primary causes of job satisfaction, and dissatisfiers (which Herzberg also calls 'hygiene factors') that are extrinsic to the job and the primary causes of job dis satisfaction, or "unhappiness on the job". Job satisfaction and job dissatisfaction are not opposites. Motivating factors include: "achievement, recognition for achievement, the work itself, responsibility, and growth or advancement" and lead to job satisfaction. Their absence leads to lack of job satisfaction. Dissatisfiers include: "company policy and administration, supervision, interpersonal relationships, working conditions, salary, status, and security" and determine the level of job dis satisfaction. Herzberg found that many of the dissatisfiers had a small effect on job satisfaction e.g. supervision; likewise some motivating factors reduced job dissatisfaction to some extent e.g. achievement. The relevance of Herzberg's theory for Human Resources Management (HRM) is the need to clarify whether the problem being addressed is mainly one of job satisfaction or one of job dissatisfaction, and then to select the appropriate personnel management strategies. For example attending to salary levels and working conditions will primarily reduce job dissatisfaction and therefore increase staff retention. To improve motivation and thereby increase staff performance, attention should be given to motivating factors, for example by increasing the individual's sense of achievement and to demonstrate recognition of that achievement. Another important element for staff motivation, especially in rural areas, could be feed back from the community. This could play an important role with respect to recognition and achievement, especially when supervision is not frequent and feed back from colleagues and managers is lacking. Although feed back from the community is not an adequate substitute for professional appreciation of service delivery of staff, reactions from clients on the service they received can help staff in assessing if their services are 'job satisfiers' and motivate them to put more effort in service delivery. The link between the main elements of the study is shown in Fig. 1. The application and the value attached to the use of the different HRM tools and to feedback from the community will probably depend on the socio-cultural environment people work and live in. The study in Viet Nam assessed the match (or mismatch) health workers perceive between the factors they perceive as motivating and discouraging in their work and the implementation of HRM tools. In addition, it looked at the relation between the community and the health workers. The research results will be used to improve HRM training for health managers and provide information for the development of Human Resources Development (HRD) policies. 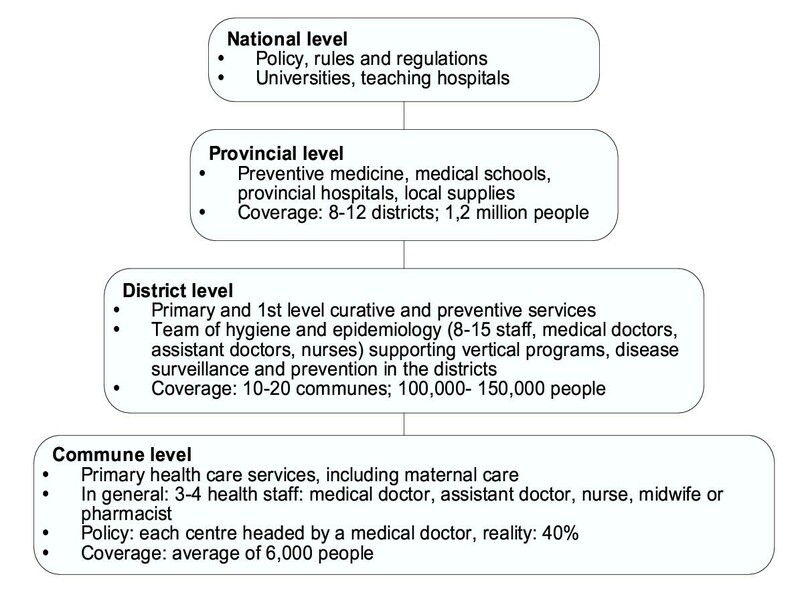 The health system in Viet Nam has four tiers, as shown in Fig. 2. At village level the policy is to have one volunteer Village Health Worker (VHW) in each village. (Villages are administrative subunits of communes, and are often separated by agricultural areas. Villages can be quite widely scattered in remote areas and be quite far from the CHC.) These volunteers are members of the community who receive training from the provincial health service, often at the district level, to cope with the most common medical needs of the population of the village. Currently an extensive network of volunteer health workers in the villages exists, about 52% of all villages in Viet Nam have a VHW . Health system in Viet Nam. Health workers working in public health in rural areas face many difficulties. Salaries of public health personnel are very low, averaging US$ 29 per month. Although allowances are provided for various kinds of tasks or for the implementation of projects, it remains difficult to survive just on the income. Therefore most health professionals engage in other income generating activities, such as private practice, agriculture etc. . For medical doctors it is for instance, more attractive to remain in the urban areas, where there is a potential market for private practice. It is therefore rather difficult to recruit medical doctors for the facilities in the rural areas and once recruited to retain them. For preventive staff and other staff not being able to start a private practice it is even more difficult to be placed in a rural area, as opportunities for additional income generating activities are limited. However, 80% of the Vietnamese people live in rural areas and most of the public health staff (84%) currently works there , but often posts are vacant or staff occupying posts is not sufficiently qualified for their job. In addition the difficult working conditions and low salaries are not sufficiently attractive . The study was conducted in two provinces in North Viet Nam: Bac Ninh, which is a well developed delta province in the North eastern region and Lao Cai, a less-developed mountainous province in the North western region. In the two provinces an exploratory qualitative study was conducted. The research team consisted of 6 members: 3 researchers from the Hanoi School of Public Health, two provincial health workers – from the two provinces – and one KIT expert on rapid appraisals. criteria for a "good health worker"
The research team received a training of five days during which they were introduced in the topic of Human Resources for Health and rapid appraisal techniques. During the training, they developed and pre-tested the data collection instruments. Sites and respondents were selected using purposive sampling. The organisational level was assessed by interviewing 14 policy makers and managers, including the vice chairman of the people committee, the (deputy) head of the provincial health bureau and the (deputy) head of the district health centre. Perceptions of health workers were researched by interviewing 24 health staff working either at district or commune level; 15 men and 9 women. At district level 12 members of the Hygiene and Preventive Medicine team were interviewed and at commune level 12 public health workers. Community perceptions were collected through exit interviews, that were conducted in a separate room at the clinic premises with 11 people who visited the health care clinic. All were local people, living in the same community as the health staff. In addition, eight group discussions were carried out. Four with Public Health workers in the district, each group consisted of 6 people and four discussions with community representatives, each containing 7–8 people. During the interviews and group discussions, some visualisation methods were used. For instance in order to determine the order of importance for motivating and discouraging factors, health providers identified and weighted the factors they mentioned by using a preference pair ranking matrix . The data were reported and recorded by tape, and were transcribed immediately after the data collection process. The data were summarised on master sheets according to the different research topics for each type of respondent. The researchers discussed the data with each other, and perceptions of interviewees were identified and reported. No major differences emerged between the various districts or at the various levels, nor were there main differences between the points of view of men and women. Therefore perceptions of all interviewed health workers have been combined in the presentation of the findings. All policy makers were male. The health staff at district level consisted of 12 people, of which 10 were men and most of the interviewees (7) were medical doctors. At community level, 12 people were interviewed, of whom 7 were women, and the main professions were assistant doctor, nurse or midwife. All of the interviewed staff had a permanent job with the public health sector. Respondents were asked to mention the main motivating and the main discouraging factors and to order them by comparing these factors two by two. The health providers identified and weighted the factors they mentioned by using a preference matrix. In total for all interviewees only 10 different types of motivating and discouraging factors were mentioned. This allowed the researchers to compare the main motivating and discouraging factors of the health workers and to develop a table showing the average. The order in Table 1 and in Table 2 is the average priority of the first 5 main motivating and discouraging factors for the interviewed health workers. What discourages you in your work?
" I like my job and I am happy that people believe in me. The Village Health Workers trust me, and ask me to help them when needed. I am very proud of that. They are willing to work so it makes me happy. I have retraining and awards every year and the community believes in me. They respect me a lot, so I think I need to work hard for them"
Discouraging factors for health providers at commune and district level are shown in Table 2. "We have very little allowance and salary and the assessment of our boss is not appropriate. It is difficult to execute our plans and we lack communication skills, especially when working in the community". District health workers mentioned as third discouraging factor a lack of updated information, whereas commune health staff gave this a low score and considered a lack of knowledge an important discouraging factor. Continuing education is by both managers and health personnel translated into "training", and updating knowledge is only really considered when it is through training. Other ways, such as meetings to increase knowledge are not seen as a form of education, although these meetings seem to be organised. Staff also considers books and journals important for upgrading knowledge, but mentions that there is a lack of printed material. There appears to be two types of training, training for a diploma or certificate and training to upgrade knowledge. "I want to study for Medical Doctor, because I am still young, but I do not know how to get the training. I think I need to work well so my boss will give me the chance to be trained"
These courses count for the cv of health staff and are therefore considered for a career path. Most people did not express interest in a career. It is not clear why they do not seem interested, probably because "career path" is not a well-known concept in Viet Nam, although it could also be due to a misunderstanding of the question. Most staff that was interviewed expressed that they are not interested in changing position, they prefer to stay in their current position, but find upgrading their knowledge regularly through training very important. Training to upgrade knowledge is, mostly, organised by vertical health programs. According to the managers and the policy makers, this type of training appears to be organised without coordination with the district level. Training by vertical health programs is regularly conducted for the head of district and commune health centres and health workers that are responsible for certain programs. According to managers this type of training does not count for the cv of health staff. As these courses provide payment of per diems, many health workers perceive participation as an income generating activity. However, health workers feel that not all staff has equal access to these training programs, which is a reason for some to feel that they lack training and income from training. "We discuss and exchange information with VHW and our staff. Concerning information from higher level, it is very little, we don't know much about new policies or regulations." This lack of information is considered an especially important discouraging factor at district level. Relationships at the workplace were in general considered as good, although the researchers had doubts with respect to the willingness of the interviewees to criticise managers and colleagues. Managers and staff mention that salaries are paid in time and according to official salary scales, but all interviewees consider these salaries as insufficient to cover basic needs for a family. All staff interviewed had a permanent job, which they considered as important as it provides a stable income. In addition to salaries, government allowances are paid for certain tasks, responsibilities or working in certain geographical areas. However, managers mentioned that the main source of income from the public sector was the vertical programs, that have their own payment levels. The health workers interviewed confirmed this. In general, health staff considered equipment and drugs to be sufficient, but transportation was mentioned as a problem. In the health facilities health workers often have to use their own (motor) bikes for supervision and outreach. They receive an insufficient reimbursement for fuel.
" During supervision of the provincial program such as malaria, the supervisor comes and looks at the record books. If there is something wrong we sit together and fix it but there is no feedback and sometimes I don't know if my work is acceptable or not." This is important as feedback is one way to show appreciation by managers and colleagues, which was the most important motivating factor for the health workers. "We send the appraisal report to the district health centre in a certain period and in the report we write down what we have done and we give a self assessment, but we always assess ourselves positively. The result will affect the assessment of the group". Also during performance appraisal appreciation can be shown and therefore can be an important entry point for staff motivation. According to managers and policy makers, an additional token of appreciation that is commonly used in Viet Nam is the award system, which is linked to the bi-annual appraisal. Awards (money, certificates or other tokens) are given to people who are assessed as excellent workers. Although its value has decreased over the years, the award system is still appreciated by the health workers. Apart from the award system, strategies to motivate staff are not common. The research showed that the community in the study sites does appreciate and respect their health workers. However, researchers doubt the willingness of the respondents to criticise openly the health workers, as the positive perception in this research seems in contradiction to the low utilisation rate of public health services. An additional complicating factor is that a lot of health workers have a private practice next to their work at the public facility. The community members interviewed appreciate the health workers, but were not asked to distinguish between meeting the workers in the public facilities or in the private facilities. Therefore it is difficult to interpret these data solely for public health providers. Opportunities for community feedback are provided through a suggestion box in each facility, but those are rarely used. During group discussions, people mentioned ways to show their appreciation through inviting health workers to participate in community activities, and by participating in educational campaigns. Feedback from the community was for both district and commune health workers the second most important motivating factor and it seems therefore required to find ways to assure community feed back. This appears especially important in rural areas. As health workers in remote areas are less likely to receive supervision, feedback from the community could become an important tool for staff motivation. The team of researchers was familiar with collecting qualitative data, but had limited experience in certain visualisation methods and some team members were not familiar with reporting of qualitative data. Despite the training, this resulted in a loss of data. It appeared that it was not always easy for interviewees to express themselves openly. For instance, managers and policy makers were reluctant to provide their perceptions on the HRM rules and regulations and their implementation. The interviewees provided factual information, but refrained from criticising this. The health workers were more forthcoming with their opinions, but to a limited extent: for instance information on collaboration with colleagues was difficult to retrieve. The interviewers found no differences in points of view on motivation between the different levels, nor between men and women. This finding might be correct, but it also might be that the interviewers did not sufficiently probe to identify these differences. In addition during data analysis motivational factors were not analysed according to different professions. It would have been interesting to distinguish between professions as research in Georgia and in Jordan revealed differences in motivation between professional groups . The study revealed a difference in age and in gender in Jordan only. Despite these limitations, the information obtained allows a general comparison between the motivating and discouraging factors and the perceptions of health workers and managers on Human Resources Management tools that are used to influence functioning of staff. The results indicate that salaries and working conditions discourage public health workers in rural areas in Viet Nam. The low salaries force them to gain extra income in other ways, either through working in the private sector or through agriculture and animal husbandry. The extent to which this takes place was not researched, but the fact that people earn income through other ways than their regular job is widely accepted and tolerated. There is a risk (not assessed in this study) that the extra work influences the accessibility to and the quality of care provided at the public service, by referring to own clinic, by low attendance in the public health facility etc.. When health workers are present at their work, managers need to find appropriate HRM tools to motivate them to perform well, thus improving quality of care. The results indicate that there is a mismatch between what motivates health workers in rural Viet Nam and the use of HRM tools. Health workers appear to be motivated by recognition and respect from their managers and colleagues and from the community. "Appreciation by boss and colleagues" can be achieved through good relationships at work and by performance management activities such as performance appraisals, supervision and access to in-service training. The study showed that the HRM tools that contribute to staff motivation are currently not optimally implemented in rural areas in North Viet Nam; supervision is mainly perceived as a tool for control, appraisals are considered to be for administrative purposes rather than for improving performance and the criteria for selection to training are not always clear. Feed back from the community appears to be important for health workers in rural Viet Nam as appreciation by the community of the performance of health workers is seen as an important motivating factor. "Appreciation by the community" can be achieved by setting up a mechanism whereby information from the community is collected, through for instance exit interviews and discussions in the community. Currently such a mechanism is lacking in Viet Nam. CREDESA described that in Benin health professionals consider "being able to do the work" and "relation with the community" as main motivating factors . These results confirm the importance of achievement, recognition and self fulfilment as motivating factors for health workers. This can be achieved through appreciation by boss, colleagues and/or the community. The results of our research correspond with Herzberg's theory for motivation at the workplace: salaries and working conditions are important to retain staff, but alone are insufficient to lead to better staff performance; recognition and feeling of achievement are more likely to influence staff motivation and therefore their performance. It also shows that although staff is discouraged for various reasons, they still can be motivated to perform. The findings reinforce the importance for managers to select the most appropriate HRM tools for the job, which are different for solving problems of staff retention and staff motivation. Consider both non-financial and financial incentives for health workers. Currently most incentives that are developed are focused on improvement of payment and of working conditions, often with the expectation to improve performance. The study gives an indication that although financial incentives are important, they are not sufficient to motivate personnel to perform better. To achieve better staff motivation, attention should also be paid to incentives that focus on showing appreciation and respect. This can be achieved through performance management (supervision, training, performance appraisal and career development) and feedback from the community. Developing mechanisms that assure regular information on perception of clients on service delivery seem to be important for health workers. This should be used additionally to the existing HRM tools for performance management. Improve implementation of performance management activities as they can contribute to motivation of health staff to work effectively. When non-financial incentives are considered, managers should have the capacity to implement selected performance management activities. Examples of performance management activities that were considered important in the study: supportive supervision, better use of performance appraisal and clearer access to training. These activities can be improved through training (and supervision) of managers and providing tools and guidelines. Establish tailor made performance management systems. If possible, the performance management activities mentioned above should be integrated in a performance management system. This management system is defined as "an interrelated set of policies and practices that, put together, enable the monitoring and enhancement of staff performance" . It implies linking tasks executed by a health worker to supervision, performance appraisal, access to training and career development. Such a system will create an environment in which a health worker can see what she/he has achieved and others can recognise this . A performance management system would facilitate the HRM tasks of health managers. Involve health workers in the design of a motivation system. Research has shown that managers and workers do not necessarily perceive motivation in the same way . This implies that the perceptions of health workers on motivation have to be known before a system is being proposed. Our experiences show that qualitative research is an appropriate method to explore and describe perceptions of health workers on motivation and HRM issues. It is at the same time a starting point for a participatory approach in designing HRD policies. Ensure that managers clearly understand the impact of different HRM tools on staff retention and staff motivation to perform well. As many managers believe that an increase in salaries will solve the motivation problems, it is important that they understand that though important, improvement in payment will be insufficient to achieve a sustainable better performance. HRM experts should support managers in developing appropriate (and cultural and gender sensitive) HRM tools for staff motivation. Organisational assessment of health services through other methods than interviews with managers and health workers (review of documents and reports, observation, data from supervision visits, HRD and HMIS records etc.). Answers to these questions would also make a welcome contribution to the international literature on the use of HRD tools to influence the performance of health workers. All authors contributed to and approved the final manuscript.